When we talk about sago, these uncooked pearl-like 2mm in diameter white balls are usually presented in some of the South Asian cuisine desserts. Being a multi-racial country like Malaysia, we have so many desserts that have cooked sago as one of the ingredients, namely the Abok-Abok, Steamed Sago with Palm Sugar and Coconut Milk, Chilled Blended Honeydew with Sago or even the Mixed Leng Chee Kang with bigger and colorful sago pearls. Did you notice a similarity in all these desserts? They are all served as sweet desserts. There is one sago dessert in the Teochew community which is fast becoming extinct and it is served salty but spicy. I’m going to share with you the recipe today on how to make this dessert. 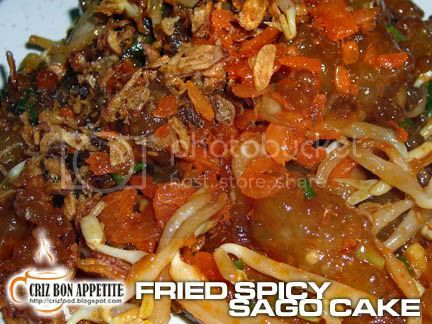 I call it the FRIED SPICY SAGO CAKE. 1. Get a mixing bowl and pour the soaked sago pearl into it. 2. Add in 1/2 teaspoon salt, 1 Tablespoon soy sauce, 1 teaspoon sesame oil and some pepper. Mix thoroughly. 3. Oil a 20cm by 20cm (8”x8”) square baking tray. Put the mixed ingredients into the tray and press down firmly. 4. Heat up some water in a wok and steam for 30-40 minutes under medium fire. DO NOT OPEN THE LID while steaming as the sago might not be cooked properly. 5. Leave aside to FULLY cool down before cutting the sago cake in 3cm by 2cm rectangles. 6. In another wok, heat up 4 porcelain spoons of oil. 7. Saute the chopped salted turnip (Chai Po which is easily obtainable in any Asian stores) for 15 seconds under low fire. 8. Add in the chili paste and stir until you get the fragrance. 9. Add in one Tablespoon of dark soy sauce, one Tablespoon of soy sauce, 1 teaspoon of sesame oil, pinch of salt and sugar, some pepper and stir thoroughly. 10. Put in the diced sago cake and mix well. 11. Add in the bean sprouts and stir until cooked (almost transparent look). 12. Dish out to serve. 13. Garnish with some fried dried shrimps, fried shallots and some spring onions. NOTE: I did not add too much of salt or soy sauce into the dish as some brands of the dried shrimps can be quite salty. If it’s not salty enough for your taste bud, you can always sprinkle some soy sauce on it. Good Luck! USEFUL TIPS: Do not worry about some tiny white spots left in the center. Leave it awhile as the heat itself would make them translucent. Depending on the freshness of the sago pearls, you might sometimes get 5% of the sago still with spots. You can ignore these as they are still edible. YOU CAN CHECK HERE FOR MORE RECIPES. This is a very entertaining blog. Well-written and clever. You are now on my favorite list. nice sago cake, are you cooking this for our dinner during the gathering? Btw, what is this abok-abok? never heard about that. Where can get it? I got a chance to taste this dish from my SIL’s mother. It’s tasty and similar to fried koay kak. wahh..never tot sago can be eaten like that! muz try!